Potentially useful to a broad range of students, Argument Diagramming provides an introduction to exploring and understanding arguments. This course will explain what the parts of an argument are and how to break arguments into their parts and create diagrams to show how those parts relate to each other. Learn about Open & Free OLI courses by visiting the “Open & Free features” tab below. Argument Diagramming provides an introduction to exploring and understanding arguments by explaining what the parts of an argument are, and how to break arguments into their parts and create diagrams to show how those parts relate to each other. 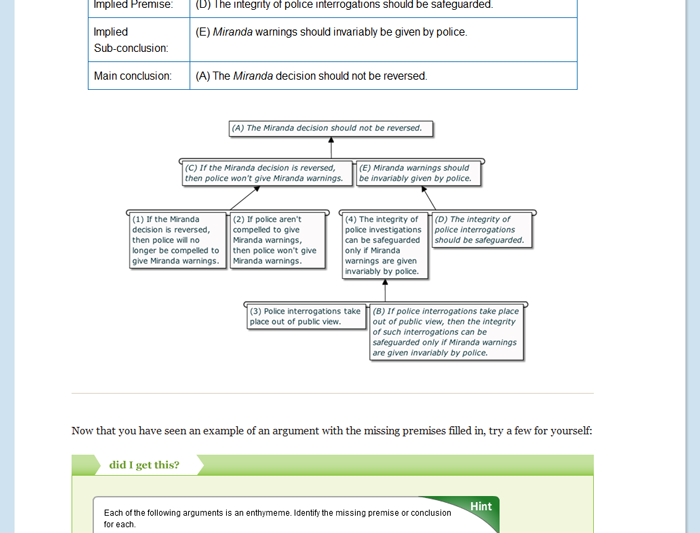 Argument diagramming is a great visual tool for evaluating claims that people make. By the end of the course, you will be able to think critically about arguments or claims and determine whether or not they are logical. This skill can be used in a variety of situations, such as listening to the news, reading an article, or making a point in a meeting. This is an introductory course and may be useful to a broad range of students. Addition of instructional material and activities on Creating Argument Diagrams, including the integration of iLogos, an argument diagramming software created by Dr. Matthew Easterday at Northwestern University, providing practice opportunities in the construction of argument diagrams. Addition of modules about 1) evaluating arguments and 2) rhetorical features of arguments. Introduces the concept of argument diagramming as a way to visually represent the content and structure of an argument. It focuses on basic vocabulary and methods for determining argument structure. 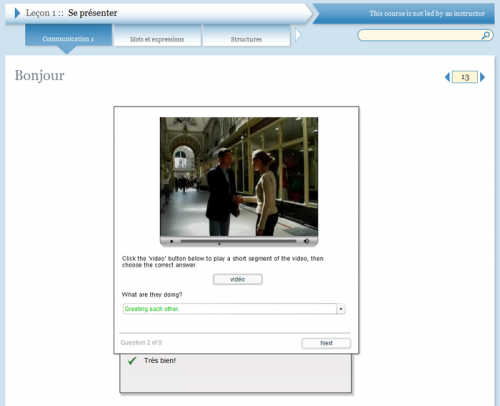 Each section of the module has a set of exercises for which students receive hints if they are stuck, and immediate feedback on their answers. Module 1 also introduces iLogos, the built-in argument diagramming software. This software allows students to build argument diagrams easily and quickly. Introduces basic logical concepts such as validity and strength, and explores ways of evaluating arguments according to these logical standards. Arguments are classified as either deductive or non-deductive. In the section on deductive arguments, students are introduced to common argument forms, such as modus ponens, and common logical fallacies, such as the fallacy of affirming the consequent. In the section on non-deductive arguments, students are introduced to 4 basic argument types: statistical arguments, inductive arguments, abductive arguments, and arguments by analogy. Builds on the skills that are introduced in Module 1, to introduce ways to tackle longer, more complex arguments. Students are introduced to basic rhetorical vocabulary and classifications, such as genre and exigence. Students are taught, through examples and tips, how to use these classifications to build a reasonable representation of the content and structure of arguments embedded in longer texts. be able to think critically about arguments or claims and determine whether or not they are logical. Be able to apply skill in a variety of situations, such as listening to the news, reading an article, or making a point in a meeting. Recreate an argument diagram using the iLogos argument diagramming software. Apply the rules of syntax and semantics when creating an argument diagram. Create individual and complete statements from a given sentence. Identify conditional statements, antecedents and consequents. Identify the conclusion and premise in an argument. Use the iLogos program to construct an argument diagram. Recognize and diagram complex arguments. Recognize and diagram convergent arguments. Recognize and diagram linked arguments. Recognize and diagram sub-arguments and chain arguments. Diagram arguments in which the author includes objections and replies to those objections. Identify implied premises and conclusions, incorporate them into the argument, and diagram the argument with the implied claims. Identify implied premises and conclusions. Interpret and reconstruct arguments with fairness and charity. Evaluate simple deductive and non-. Evaluate simple deductive and non-deductive arguments. This course provides a two-week exploration of the task of Argument Diagramming. *If your teacher gave you a Course Key, do not use an Open & Free course because your teacher will never see your work.